News & Stories > Blue Sky Science > Does space go on forever? 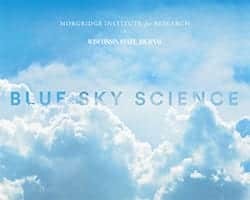 Blue Sky Science: Does space go on forever? Does space go on forever? We really don’t know if space goes on forever. The universe is big enough that we can’t see all of it for a number of reasons. And there are ways that we could live in a space that doesn’t go on forever, but still has no actual edge to it. It’s easier to imagine if we think about a universe with only two dimensions. Think about a balloon as a model for this universe. In this universe, we live on the surface of the balloon, a two-dimensional space. You could forever go around and around the balloon, in any direction you want, and never run into an edge. But it’s not infinite. Imagine, like in our case, a universe that’s expanding. As we pump more air into the balloon, we’d see the space or surface area expanding and every point or galaxy living on the surface getting farther and farther away from each other. That expansion might go on forever, but the universe itself is still finite. There is another ‘edge’ we can think about in terms of the universe. At a certain distance away from Earth, objects disappear from our field of view as the universe expands and those objects recede away from us. The remaining “visible universe” is what astronomers call the galaxies and matter that are observable from Earth. The visible universe might be much smaller than the real universe because it excludes objects that are too many light years away and because emitted light hasn’t had time to reach Earth. Are there wormholes that lead to other galaxies? Why is there gravity on Earth but not in space?